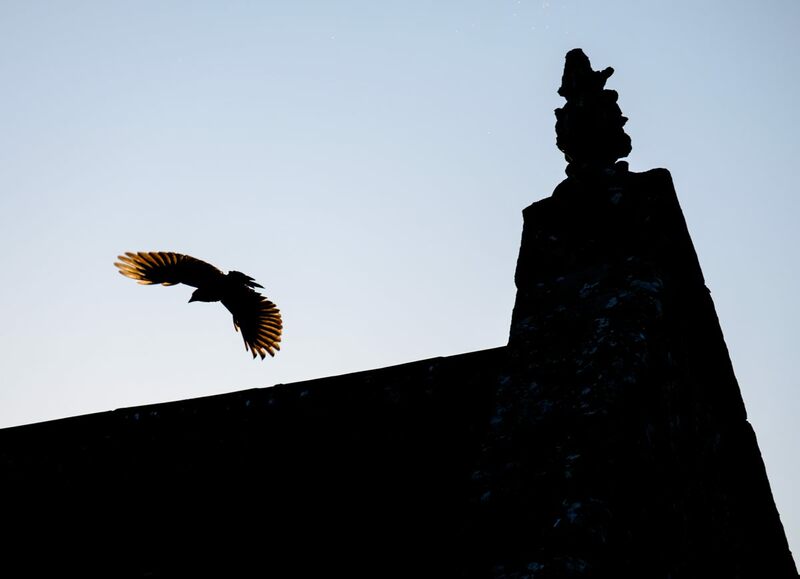 A Jackdaw, the smallest of our crows, flying around the church’s decorative architecture. A lucky grab shot. Technique: X-T2 with 55-200 Fujinon lens at 300mm (equiv); 200 ISO; Lightroom, using the Velvia/Vivid film simulation; Stanton Drew, south of Bristol; 6 July 2018. 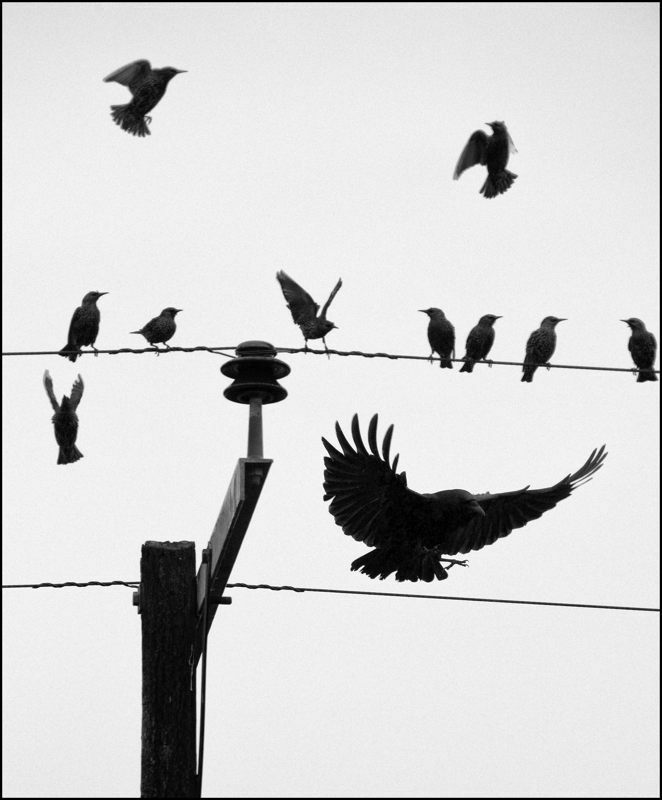 How I love crows! 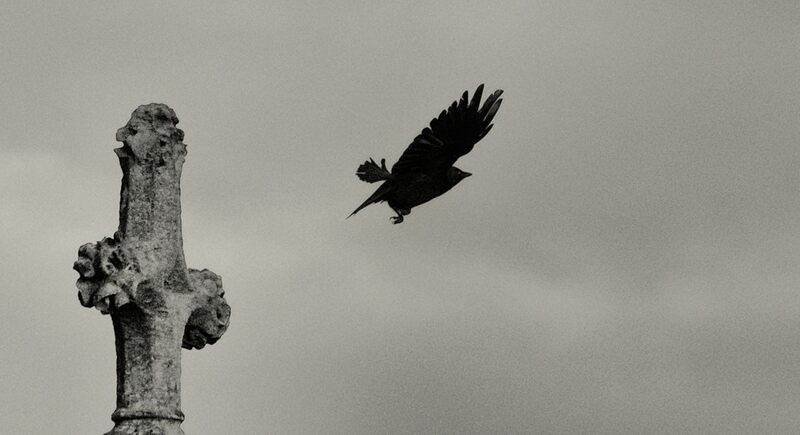 >>> this was a very lucky, very quick shot – the bird was perched on the church’s rooftop cross, I raised the camera – and, instantly, it flew! 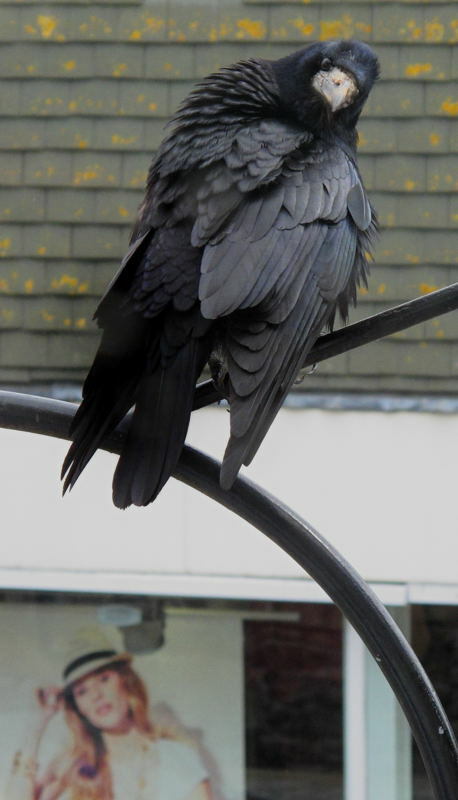 Another recent picture of Jackdaws, on a building nearby, is here. Click onto the image to open a larger version in a separate window – recommended >>> in this enlarged version you can just make out the bird’s pale (in fact, white) eye, which is one of its identification features. Technique: X-T2 with 55-200 Fujinon lens at 305mm (equiv); 3200 ISO; Lightroom, using the Velvia/Vivid film simulation; Silver Efex Pro 2, starting at the Full Contrast and Structure preset; Stanton Drew; 6 Nov 2017. 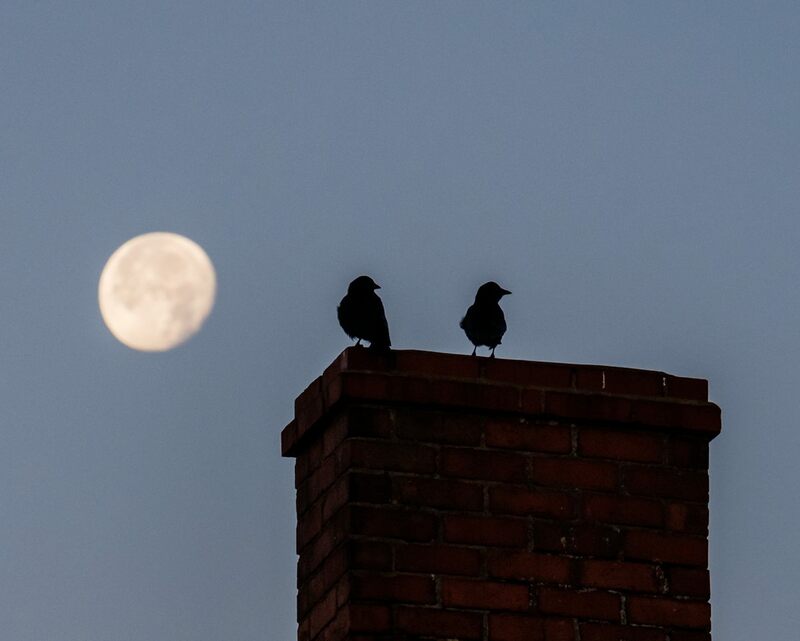 A bright moon on an icy morning, just at sunrise, and a pair of Jackdaws are on the top of a chimney in the village Stanton Drew, not far south of Bristol. 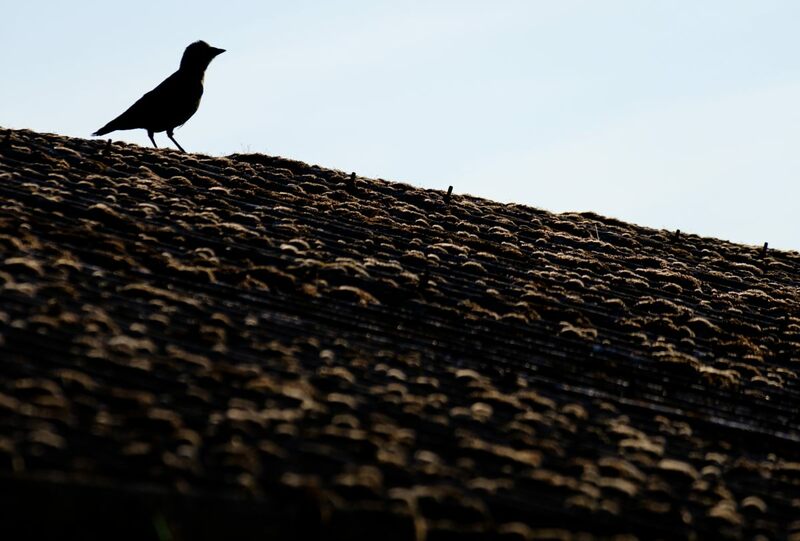 Jackdaws are our smallest crow, they pair for life, and they are often around our houses – and especially our chimneys – in which (amongst other places) they nest. They are sociable, garrulous and often quite accepting of man, and I have a lot of affection for them – but then, I have a lot of affection for wildlife generally. Click onto the image to open a larger version in a separate window, and click onto that image to enlarge it still further. Technique: X-T2 with 55-200 Fujinon lens at 305mm (equiv); 3200 ISO; Lightroom, using the Provia/Standard film simulation; Stanton Drew, near Bristol; 6 Nov 2017. Starlings are flustered and scattered as a Carrion Crow flies in amongst them; Tadham Moor, on the Somerset Levels; 1 Nov 2013. There is another image from these moments here. Technique: D800 with 80-400 Nikkor lens at 400mm; 1600 ISO; Silver Efex Pro’s High Structure Harsh preset. Carrion Crow perched in a fallen tree; Tadham Moor, south of Wedmore, on the Somerset Levels; 31 Mar 2014. 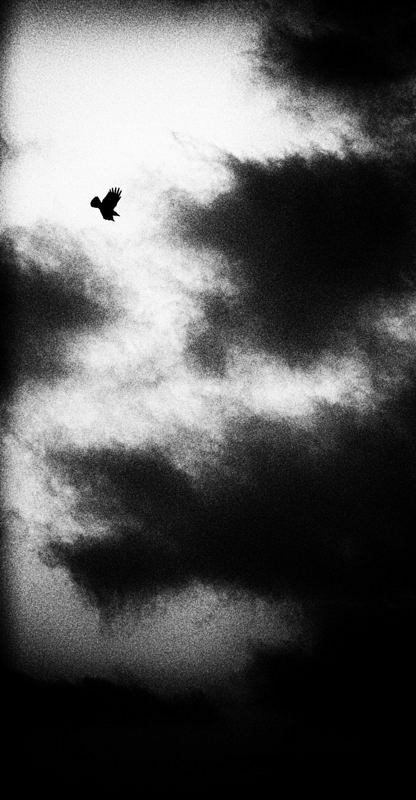 Early in the day, I pulled bleary eyed into the Magic Carpark, stumbled out of the car – and saw this crow. Praying that it wouldn’t move, and all fingers and thumbs, I readied the camera, turned and – it was still there! In fact it stayed there for sometime. The tree is a casualty of the recent severe flooding. It was probably not standing vertically before, but then its roots had been able to find sufficient purchase in the soil. But, saturate that soil with floodwater for many weeks and turn it into something like blancmange or wet rice pudding, and the roots were simply not up to the task of keeping the great bulk of trunk and branches above them upright. 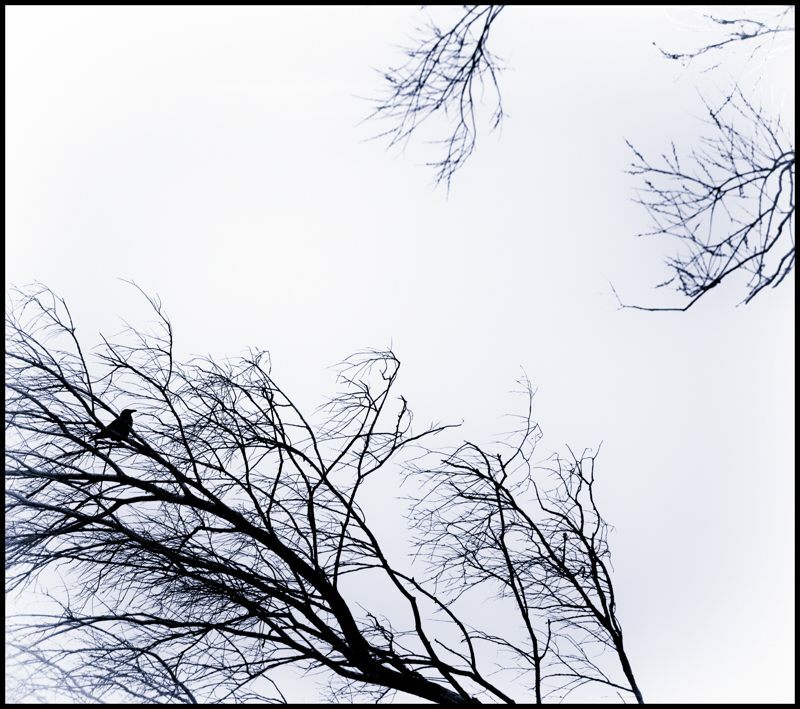 I went for a pure silhouette, with the sky completely burnt out, for simplicity – a Minimalist approach. To me, the few branches entering the frame at upper right serve to balance the composition. The adding of a blue tone takes the scene further away from reality. Technique: D800 with 70-300 Nikkor lens at 300mm; 800 ISO; Silver Efex Pro 2, starting at the Classic Portrait preset, and adding a Cyanotype tone.